A train ride is a magical experience, one that evokes nostalgia for some, the anticipation of reaching the end of the line for others. For all, it’s a way to appreciate a mode of transportation not enjoyed by as many these days. And when that train is the Portage Flyer at Muskoka Heritage Place (MHP), there’s the wonder of what it must have been like as a passenger travelling the hairpin turns and steep hills – sometimes even having to get out and push to ensure the train made it to the top – on its original route between the villages of North Portage on Peninsula Lake and South Portage on Lake of Bays. That original track is long gone, of course; the Portage Flyer stopped operating in 1959. 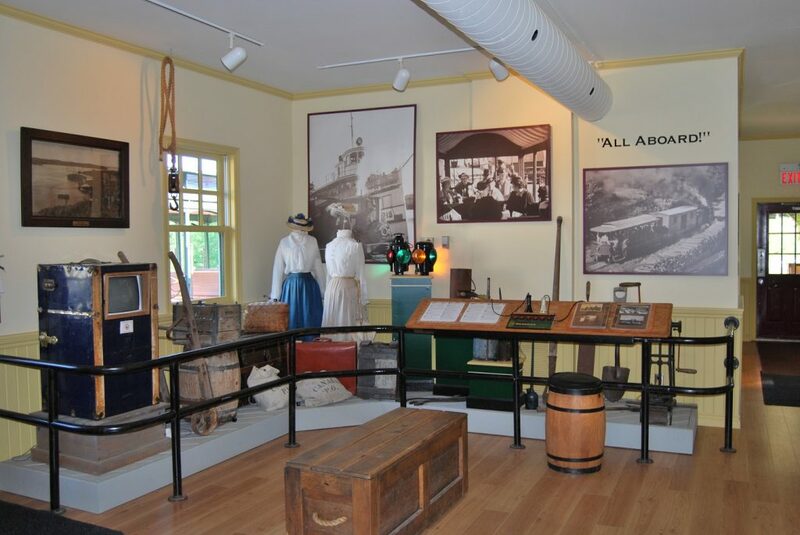 But some of the original engines and passenger cars have been carefully restored and maintained, and are now a highlight for visitors to Muskoka Heritage Place. The train, led by a steam engine in the summer and a diesel-powered engine the rest of its operating season, now ferries passengers alongside the Muskoka River to the shore of Fairy Lake where there is a restored Purser’s Cabin, which once sat at The Wawa Hotel on Lake of Bays. The Portage Flyer train station is a recreation of what train stations looked like at the time. In 1900, the Huntsville and Lake of Bays Navigation Company obtained a charter to construct a railway over the portage under the name of The Huntsville and Lake of Bays Railway. Construction began in 1903. From 1904 to 1959, the Portage Flyer – nicknamed that back in the day by locals – ran on about one-and-an-eighth mile of track (about 1.8 kilometres) from North to South Portage and back. There were no roads between the communities then, and with 170 feet of elevation between Fairy Lake and Lake of Bays dredging was not an option and a lock system would have been too costly. That left a train as the most effective means of transporting mail, cargo, building supplies and tourists to South Portage. That doesn’t mean it was easy, though, and some of its features likely wouldn’t have been approved today. A steep switchback climbed the slope leaving North Portage. The train then had to reverse to change direction and climb another 120 feet in a mere three-quarters of a mile to get to the top. But the engineering feats didn’t end there: after following a narrow pass through hills and rounding steep bluffs, it turned a hairpin bend on the shore of Osborne Lake before arriving at South Portage. The track’s highest gradient was seven per cent – today a two per cent grade is considered high for a railway. From South Portage, the steamship Iroquois plied the waters of Lake of Bays to carry passengers on to the lavish resorts of the time: The Britannia Inn, The Wa Wa Hotel and Bigwin Inn. 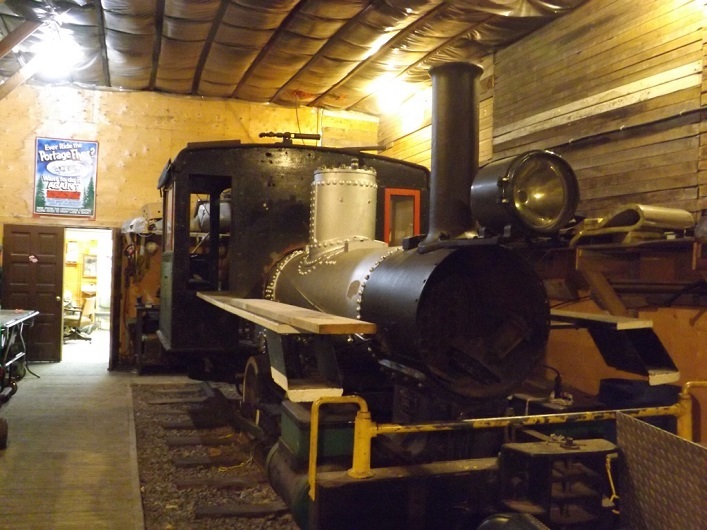 The original equipment for the railway included two 1888 vintage H.K. Porter 0-4-0 saddle tank locomotives and two twelve-foot by five-foot four wheeled box cars. In 1948, the original locomotives were sold and replaced by locomotives Number Five and Number Seven, which were built in 1926. Steam locomotive No. 5, now known as No. 1, is a 17-ton, coal-fired unit that currently sits in the storage shed at the Rotary Village Station, awaiting restoration; No. 7, now known as No. 2, is a 21-ton, oil-fired unit and is the one you’ll see in operation in the summer, Tuesday through Saturday, at Muskoka Heritage Place today. But back in 1948, it proved too heavy for the light-weight track and was put into storage. “The train would go around a corner and the rail would tip over,” notes Greg Smith, MHP’s chief engineer. 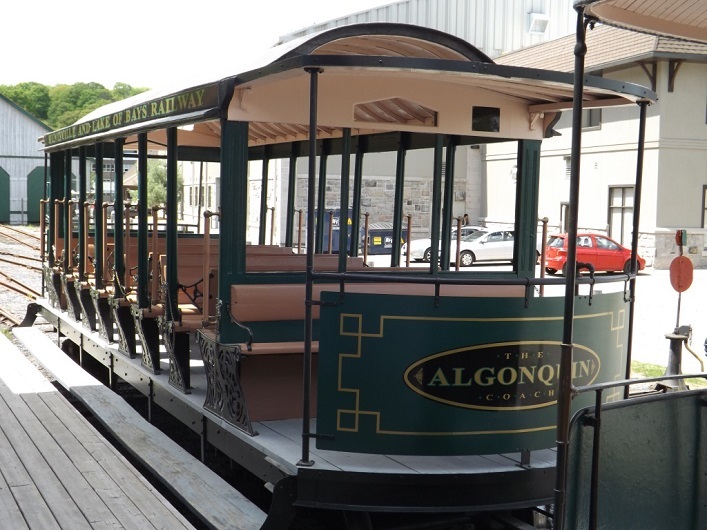 Passengers rode in two open-air coaches – the Algonquin and the Iroquois – constructed from horse-drawn streetcars from the Toronto Street Railway. The hinged-back seats could be flipped over so that passengers could always face in the direction of travel. Those coaches are used for passengers at Muskoka Heritage Place today and are much as they would have appeared when they were in commercial service, along with the addition of a brake system for added safety. When the Portage Flyer was decommissioned, the equipment was sold and moved to St. Thomas, Ontario, as a tourist attraction. 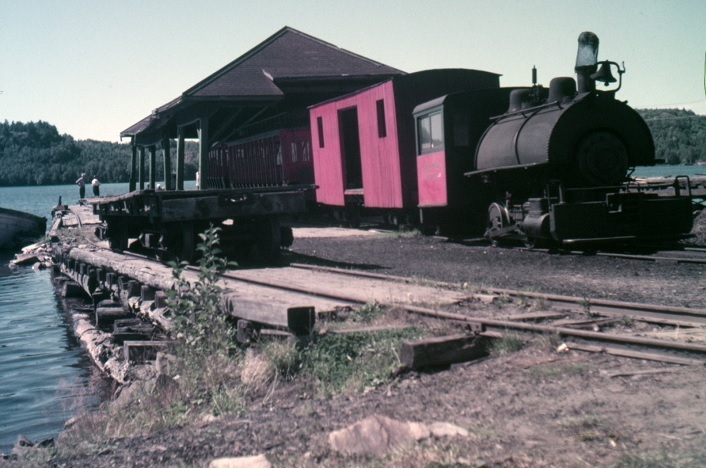 When the steam locomotives were put up for sale in 1984, they were purchased by the newly formed Huntsville and Lake of Bays Railway Society and returned to Huntsville. Thanks to the effort of local volunteers with the railway society and the Rotary Club of Huntsville, a new train station and shed were built and track laid in 1999. In the summer of 2000, the Portage Flyer returned to service. Manually operated turntables were installed in 2001 and visitors can see the 21-ton locomotive turned by hand – by just one person – at the end of the line. In 2009, the Rotary Village Station was moved to its current location when the Active Living Centre at the back of the Canada Summit Centre was constructed. The station, a replica representative of those in the area in the 1920s, contains the Steam Museum complete with a telegraph office and interactive displays. Behind the scenes, the locomotives are taken apart annually for inspection and recertification by TSSA (Technical Standards and Safety Authority), and are regularly maintained to ensure the safety of the boiler that produces the steam. At one time, it would have been coal-fired but today the water is heated by fuel oil – about 225 litres per day compared to just five to 10 litres of diesel for the other locomotive. The difference in fuel usage is primarily because it takes hours to boil the water to its point of operation for the steam locomotive and it can’t be shut off between runs. When parts need to be replaced, sometimes a bit of creativity is required. Where can you buy pieces for a 1926 steam locomotive, after all? About nine years ago, when a brake assembly needed to be replaced, it was roughed out in the pioneer village’s blacksmith shop and then Smith milled it in the train shed. “That was a really cool connection between the pioneer village, what they would have done back then, and a period train,” says Gostlin. Most of the locomotive remains original, save for minor replacements during the course of maintenance, but there have been some additions. “It was meant for a quarry when it was built,” says Smith. “It never had a headlight or a bell on it because it wasn’t needed where it was.” Both have since been added. Operation of the steam locomotive requires a certified engineer – that task is done by Smith and two trained volunteers – along with a fireman to tend to the boiler and a brakeman who throws the switches and turns the locomotive on the turntable. A conductor and station master board and debark passengers, and ticket seller greets passengers in the station. Eager train enthusiasts can get in on the action with MHP’s engineer for a day program – for a full day, get behind the controls of either the 1926 steam locomotive or the 1949 diesel electric locomotive, taking a coach full of passengers to the end of the line. Because of the unique design of the line, it’s a program unlike the few others that exist. “Because it’s such a short track, you make three trips in a day and you’re on the turntables, lining up with the coupling, and monitoring fuel and water. It’s a way more involved process,” says Gostlin. For those who don’t want to be behind the controls, there’s still opportunity to get up close and personal with the train. 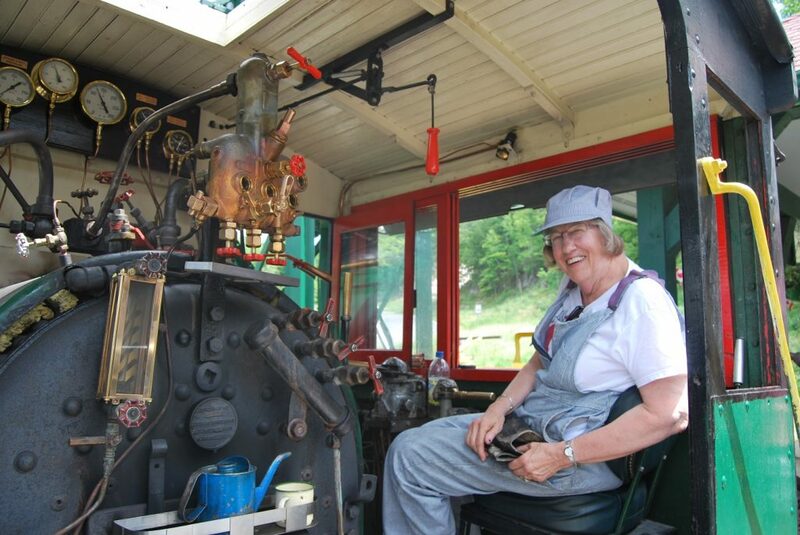 At the Purser’s Cabin, passengers can visit the locomotive’s cab to see how the controls work. Be sure to check the train schedule online or at the admissions desk before you visit – times vary and the train always leaves promptly on time. You don’t want to miss it! Your ticket is valid all day, too – ride as many times as you want. 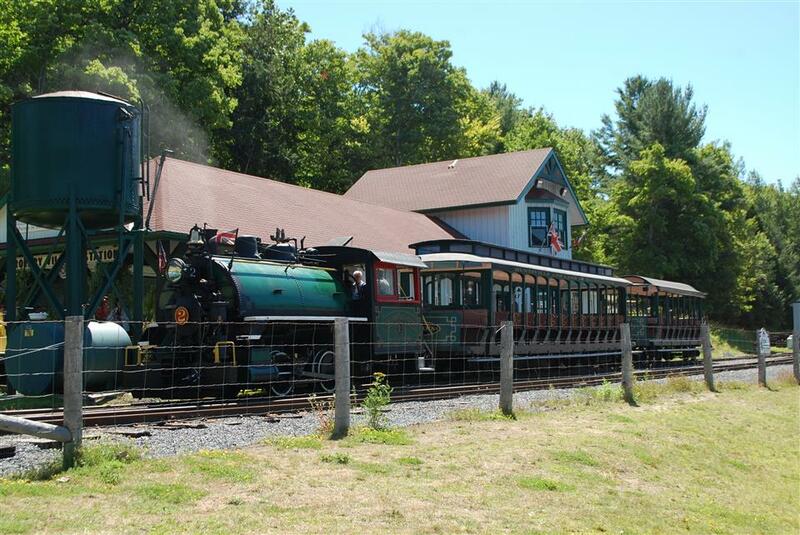 Historical details courtesy of Muskoka Heritage Place and the Huntsville and Lake of Bays Railway Society. Great article, and a real treasure for Huntsville! Have volunteered weekly for the last 18 years as the train’s conducter. Really enjoy relating the Portage Flyer’s history to the riders. Just last Friday, there were riders from Albania, Bavaria, Ireland and other provinces. Continue to be amazed at how few riders are from the local area or are riding for the first time. Have been told there will be a new book available later this year with the extensive history of the Huntsville and Lake of Bays Railway. Was on the Flyer with my family circa 1950 and rode the with my grandkids in 2012 at the Summit Centre. Very ‘trippy’! I remember when my parents had guests we used to take the boat and then the train for a special day. The train ran so slow, my dad would hop off and pick blueberries along the track. I am thrilled to hear the whistle when the train is running at Heritage Place. Brings back wonderful teen age memories. Thank you so much for the article.